Thanks to everyone who attended. I had a great time. Thanks everyone who attended my session and made me feel welcome in Charlotte. Also want to thank the Spark Conference team for putting on a great event. I’m hoping they’ll have me back next year. You’ll find my slides here. There are 3 major changes being introduced in ASP.NET 5 including a new file based project system, a new cloud optimized core CLR, and the unification of MVC & Web API into ASP.NET MVC 6. In this presentation you will learn about what the future holds for ASP.NET 5 and how you can begin to get ready for it. 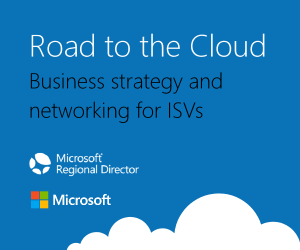 In cooperation with Microsoft and the Microsoft Regional Directors program (www.msrd.io) I'm going to be hosting & presenting a "Road to the Cloud" session and networking event October 28th (1:00pm-6:30pm) at the Raleigh / Durham Microsoft offices. The Road to the Cloud is a series of global events led by Microsoft Regional Directors. The event focuses on the tremendous opportunity the new cloud market presents for the business leaders of established ISVs. Business leaders of independent software vendor organizations (ISVs) face increasing challenges in today’s software market: many companies are now evaluating software as a service to replace their legacy software. The technical challenges are significant, but the business changes are arguably far more challenging. Join this event to hear about best business practices and lessons learned about the cloud opportunity for a software business. This event is focused on business strategy, and is not a technical learning event. These events will be held all over the world. Here is a link to the Raleigh event: http://bit.ly/1vv0bl0. Here is a link to the main event page: http://bit.ly/1sLmEgG. You should attend this event (or recommend someone else attend) if you are interested in learning how to capture the strategic opportunity that the new cloud market presents. This opportunity brings not just technical changes, but fundamental shifts to your company’s business model and a platform decision is a key component of that shift. I’m presenting “Modern Web Development With HTML5/CSS3/JQuery: What's the big deal?” for the Cape Fear .NET User Group September 19th. The Cape Fear .Net User Group in Wilmington, NC is being resuscitated and I’m honored to have been asked to be the kickoff speaker in what I hope will be the first of many presentations I do for this reborn user group. I’m presenting my popular “Modern Web Development With HTML5/CSS3/JQuery: What's the big deal?” session and hoping that topic will draw a good crowd for the new group. HTML has grown up and the lines separating web, desktop and mobile applications are getting blurrier every day. This is due in part to HTML5's new cutting-edge features that help developers create web applications with the features and performance of traditional desktop applications. The significance of this can be summed up in one word, REACH. Reach means more and less. more devices, more opportunity, more productivity, more audience and less reliance on browser plug-ins like Flash and Silverlight. In theory, HTML5 enables you to deploy your latest version to all your users regardless of the device they're using because they all share the same common UI platform, the browser. In this session we will explore new features in HTML5 and discuss techniques for maintaining backward compatibility with legacy browsers. We will also touch upon some of the new features in CSS3, including media queries through which attendees will be introduced to responsive web design and its role in the mobile first web design movement. If you’re in the Wilmington area it’s not to late to reserve your seat for Wednesday night. I hope I see you there. Microsoft Developer Evangelist Brian Hitney and I want to help you get your app in the store in time for the October 26 Windows 8 launch. Come join us on Tuesday, September 25, at 9:00 AM in the Microsoft RTP offices to learn how simple it can be to construct a world class Windows 8 application. Don't think you can be ready to join the Windows 8 launch? Come anyway. You might be surprised. Don't have any idea what kind of app to build? Come anyway. They're are plenty of places to look for inspiration. Either way you can learn what it takes to create or tune an app for Windows 8 and publish it in the Windows App Store. Learn more about this free event on the registration page. Registration is now open and space is limited. This .NET Guru can cook!! Come on, who doesn’t love a good cheeseburger? Ok, I’ll rephrase that. Other than the Chik-fil-a cows and vegetarians, who doesn’t like a good cheeseburger? Check out this episode of the Grapevine TV’s Developer’s Kitchen and watch me demonstrate how to prepare and grill up my Duffy’s Paradise Cheeseburgers! mmmm tasty! Looking for additional recipes from your favorite .NET personalities? Check out the .NET Guru’s Can Cook cookbook for a wide variety of tempting appetizers, dishes, sweets and drinks. Pick something and make it this weekend! I had a great time doing this and want to thank Don Williamson, Fuss Fustino and the rest of the GrapeCity team for inviting me to participate in this project and for their warm southern hospitality. It’s official!! Microsoft released Visual Studio LightSwitch 2011 today. Here are a few places to read more about today’s release and for more information about LightSwitch 2011. I’m excited about the release. Today’s timing is perfect since we have a project we’re about start and we’re going to be using LightSwitch in order to quickly get a functioning application in front of our users. Based on the initial prototyping work we’ve done with the beta, we’re expecting to save a significant chunk of time going with LightSwitch. What we find most compelling is the ability to extend LightSwitch’s built in functionality with pieces of code as necessary. We’re also going to be looking into the 3rd party resources available as well. Congratulations to the LightSwitch team! Just reminder of a post I wrote back in December. Don’t forget that there is a variety of free ebooks available for download on a number of different developer and IT topics. Developer subjects include Programming Windows Phone 7, Moving to Visual Studio 2010, and Introducing SQL Server 2008 R2. IT topics include Deploying Windows 7, Understanding Microsoft Virtualization Solutions and First Look at Office 2010 just to name a few. Oh this is just too cool… check out the new Debugger Canvas Power Tool for Visual Studio 2010. You have got to watch the demo video. It’s called the Debugger Canvas and the best news is that it’s going to be available for download from the Microsoft DevLabs next month. It looks like this could really revolutionize the way we debug code in Visual Studio. There is a lot to like here. I like being able to see all the code in the call stack. I like being able to save the status of an object for comparison later. I like being able to select a method and see all the related called methods. I like this a lot. At PDC 2010 in October Microsoft announced a number of new enhancements/features for Windows Azure. In case you missed it, these new enhancements/features have been released in the new Windows Azure Tools for Visual Studio November release (v1.3). The Windows Azure team blog is an excellent resource for information about the new release. Along with the new release the Azure team has also updated the Windows Azure Platform Training Kit. What is the Windows Azure Platform Training Kit you ask? It is a comprehensive set of hands-on training labs and videos designed to help you quickly get up to speed with Windows Azure, SQL Azure, and the Windows Azure AppFabric. The training kit contains updated labs including a couple I would suggest you hit first. Ok, that’s enough reading, go start learning! In a recent blog post I mentioned the availability of the Programming Windows Phone 7 ebook by Charles Petzold. Well I have good news, there are a number of additional FREE ebooks available from Microsoft to help you continue honing your tech skills. I, for one, appreciate Microsoft making these resources available for free. I think it demonstrates their interest making sure we as developers and I.T. professionals have the resources we need to effectively solve the business problems we encounter. Following up on my most recent post about LightSwitch I thought I’d keep you in the loop on a valuable LightSwitch resource. The Beginners Guide to Visual Studio LightSwitch provides a jump start to get you and the department-level-typical-Access-application-developing-power-user rolling with LightSwitch in no time. The guide is broken down into 4 easy to follow parts. I mentioned it in my prior post but don’t forget to check out Beth Massi’s blog for additional information on Visual Studio LightSwitch.